Eight-year-old Daniel is one of five beautiful kids born to Richard and Esther Scholes who lead a small church in the West End of Morecambe. For the last two years he has baffled doctors all over the country with a multi-system disease which has gradually spread through his brain and led to regular seizures and the loss of the use of his limbs. Just after Christmas his condition worsened and he was diagnosed with HLH, a rare fatal blood disease, probably caused by the original illness. He is currently undergoing intensive treatment and friends and family have begun a 40 day period of fasting and praying for him. 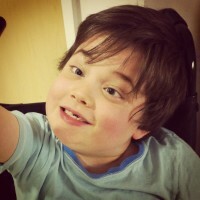 The following is a recent blog written by his mother, Esther Scholes. When we read it at Cross Rhythms we were deeply touched by the courage of faith with which she is journeying such a huge personal challenge. This is a season when God our Father is encouraging his church to face their giants by taking a stand in deep inner trust on who He is, not on what He may or may not do. Recently I wrote an article entitled 'Turning Point?' which speaks much more into this season, so do read that one as well. God bless, Jonathan Bellamy, Cross Rhythms CEO. I keep saying it, but I am absolutely BLOWN AWAY by the way people are responding to what we are going through. Friends who are spreading the word, and using their time and emotional energy to intercede on our behalf; churches who are allowing our situation to be the highlight of their prayer meetings and weekly prayer slots; strangers who are joining the Facebook group to pray and fast for us just because they've seen links and taken time to follow them; children who have decided to give up their favourite things (including eating pizza and wearing odd socks!) to remind them to pray for Daniel; and non-believers who are putting their own doubts aside to sneak prayers up to a God they're not even sure about. I mean, we're just one family, and he's just one sick kid. There are many many more in the world, but for some reason people are gathering to get behind us and support us through this dark time. In some ways it seems unfair - I keep thinking of people who lost their children in an instant, with no warning, or those who only had a few minutes or hours to watch their children die, with no chance of a prayer meeting being set up or a Facebook group formed. I keep thinking of big groups or countries of people who have lost children to famine, war, genocide or disease, and there were too many names for people to pray for them individually. I keep thinking how we have four other healthy children, and that we've had eight incredible years with Daniel, and some people never even have the chance to have one child, or have struggled to keep their children alive and then have had to see them all wiped out in a single blow. I keep thinking that if we lived in a different country, or a different decade, or had even ended up in a different hospital, we would have lost Daniel a long time ago. We are already blessed beyond belief. I don't know why people feel inspired to pray for our boy. We don't deserve any kind of special treatment. In fact, there are many times when I pray and I ask God not to look at any merit Richard and I may have, because I know we would fall so short. I ask God to look past all our failings, and Daniel's too, and just ask for mercy on our situation, because that's the only reason we can even ask. It's nothing to do with what we've done, and everything to do with who God is. It's completely up to Him if He heals Daniel. It will not alter my faith or my perspective of Him. It will not stop me from wanting to help other people to find Him, or from leading church. It will not make me ask 'How could You?' or to doubt that He is any less loving or any less powerful. I know without a doubt that He could heal Daniel in an instant, or gradually, because I know He works miracles. I know that Daniel's future is in His hands and I trust Him completely. If in eight years He has accomplished in Daniel's life everything he was born for, then I hold my hands open and refuse to try and manipulate or threaten Him, because my main desire for all my children is that they serve and glorify God with their lives and if this is God's plan for Daniel, then that is more important than any plans I could've had. After he and Joel were born I spent several hours in tears asking God why the heck He thought I could handle twins and telling Him He must have made some sort of mistake. After a day of that, God stopped me in my tracks and told me in no uncertain terms that there was no mistake, that He had planned those boys from the beginning of time, with me and Richard as their parents, because He had a purpose for their lives, and I was to give them the middle names of Joshua and Caleb because they were going to be men of different spirits (from Numbers 14). I had to give up their futures to God right there and then, and I will not take that back now. Of course I'm asking for a miracle and I won't stop asking. Whatever happens, I will need a miracle. If he is fully healed and can walk again, that will be a miracle. If he dies and I have to get up every morning and carry on with my life and bring my children up in the way God wants me to, I will need a miracle. And if Daniel survives this next two months but continues to be disabled like before, then I will need the biggest miracle of all - to set aside my many lazy and selfish desires every single day to keep giving him the specialised care and attention he needs. He is the God of miracles. He has new ones every morning. He has given us everything we have needed in the last two years - strength to fight, peace to rest, inspiration to keep moving forward, grace to cover our mistakes, hope when things were dark - I could go on and on. Thank you all so much for your prayers. I am sure that yours are far more eloquent than mine. Most of the time mine are just little whispers - 'Please, can we keep him?' - so it gives me great comfort to know that there is an army of pray-ers out there who are using a vast array of different words and styles and biblical truths. And if you are praying, I want to promise you something. If you are opening your mouth to God, whether it's to whisper or shout, to speak His authority over the situation or to praise Him, to quietly listen or to spill your anger at the way He chooses to do things; I promise you, it will change you. It will bring you a step closer to God. It will release things in you that need releasing. It will bring you closer to the answers to your own hopes and dreams. I know this because I have asked God why it should be that we are hogging all this prayer, and this is the answer He gave me. God is using Daniel to stir people's hearts, to challenge them, to open their mouths, to put faith in something they didn't believe in, to put aside things that are often in the way to spend time with their Father who loves them, and to open doors of communication with Him. There is nothing, nothing, NOTHING in this world like knowing the God who created you, and if Daniel's story has made you spend time with Him - for a minute, or day, or for forty days, then this is all worth it. And that is why, with shaky hands and lots of tears, I can say I COMPLETELY trust God with my boy. 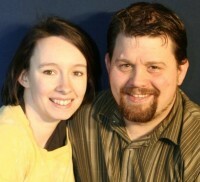 If you would like to stand with Richard and Esther Scholes in prayer or fasting for Daniel, or if you would like to follow their story then simply go to their website at www.fullhands.blogspot.com. May their story encourage you in facing the giants in your own life, and may you know a place of confidence that 'greater is He that is in you, than anything else in this world'! Richard and Esther Scholes lead a small Free Methodist church in the West End of Morecambe and have five children - Isaac (10), Daniel & Joel (8), Levi (4) and Eva (nearly 2). Wow i just want to say thank you to our Mighty God for making you so strong in your faith,i believe Daniel is already healed when this message will get to you,thank you for being a Job of old God Bless the Scholes family. Thank you for taking my faith in God to another level. O Lord thank you for filling them with your power strength and Love. I commit myself to praying for you every day in Jesus name. I heard this on the radio just this evening and I am blown away by it. So much faith, trusting God completely, it's very touching, may God continue blessing Daniel everyday of his life. Inspiring story of strength and Gods almighty love. The world needs to hear this story of hope and restoration. Will continue to pray for this much loved boy. Well, you're certainly in my prayers Daniel, mum and Dad.